The town council will put its – and the town’s – treasures on display next year in pop-up shops in the Mall. Cr Brendan Heenan says showing to the public some of the 350 paintings, which are usually stored in the Araluen art centre, will be part of the council’s continuing efforts “to breath fresh life into the Mall. Cr Heenan says the paintings “belong to the town’s people”. 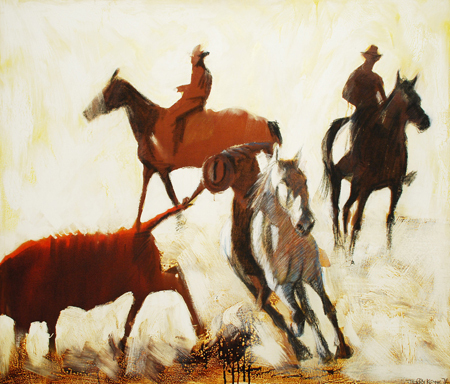 A council spokesman says the collection includes some works by Albert Namatjira – “they are the pride of our collection. Araluen curator Stephen Williamson says the collection goes back to the foundation of the artcentre. It was opened in 1984 “following the successful lobbying by the Alice Springs Art Foundation (ASAF), the Central Australian Art Society (CAAS) and other community members to the Northern Territory Government. The NT Govermnment has overseen the management and operations of Araluen since 1996. • the ASAF (from the Alice Prize 1970 to the present). • and artworks acquired by the Araluen Arts Centre through the NTG. 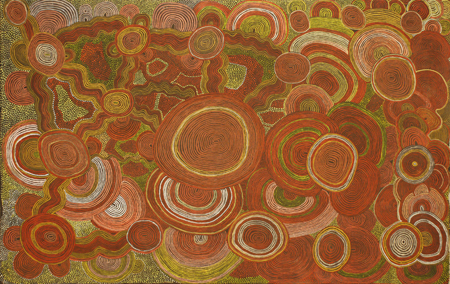 The collections amassed by the CAAS and the Alice Springs Art Foundation (ASAF) were donated to the Alice Springs Town Council for the people of Alice Springs in 1989 and 1990 respectively. Additional acquisitions made by CAAS and ASAF since have been donated to the Alice Springs Town Council collection. PAINTINGS (from top): Iain Campbell, Inside looking out, inside looking in; 1983; Jerry Keyte, Mt Allen bangtail, 1976; Shorty Lungkata Tjungurrayi, Tingari men suffer from thirst, 1974. Great initiative from the Alice Springs Town Council. An idea first raised by Cr Chansey Paech in August – good to see it get up.